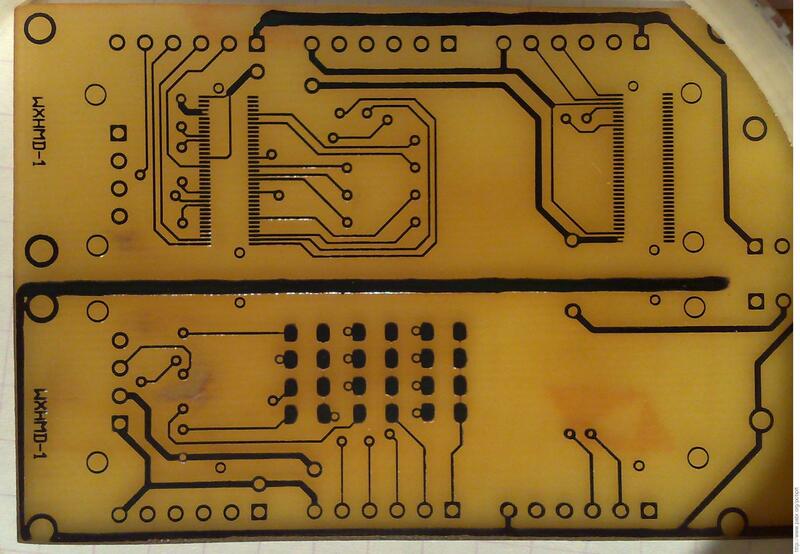 For the last few years hobbyists worldwide have been experimenting with inkjet PCB printing, i.e. manufacturing electronic circuit boards with inkjet printers. This is a report on my experience with this technique. 3.8. Is cuprous oxide the best inkjet media ? 1. 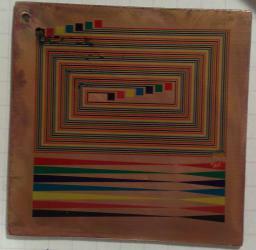 Unmodified Epson R800 printing on 200x300 mm copper-clad epoxy. 2. Poor results with abrasive pad and polishing paste. 3. Abrasive pad vs. 30 s pre-etching. 4. Excellent print quality on pre-etched copper. Milling . A mechanical cutting tool creates circuit traces by removing metal along their outlines from a copper-clad substrate. Manual etch mask . An etch mask is manually applied onto a copper-clad substrate, either by drawing trace patterns with a special pen, or by adjoining pre-cut adhesive stripes. A chemical etchant then removes uncovered copper areas. Photoresist . Trace patterns are printed on film, then transferred by UV exposure to a photosensitive resist on a copper-clad substrate. A chemical agent dissolves areas of the resist which have been exposed to UV. A chemical etchant removes copper areas not protected by remaining resist. Toner Transfer . A laser printer lays toner trace patterns on special non-absorbing paper. Toner is transferred onto a copper-clad substrate by lamination and heating. A chemical etchant removes copper areas not protected by toner. Direct Inkjet Resist Printing . 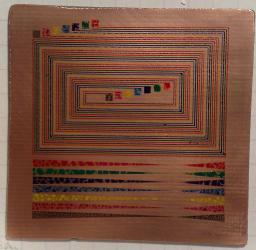 An inkjet printer lays trace patterns onto a copper-clad board with etch-resistant ink. A chemical etchant removes copper areas not protected by ink. Direct Inkjet Printing . 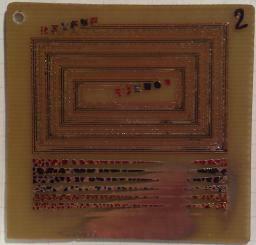 An inkjet printer creates circuit traces by laying conductive ink onto an insulating substrate. 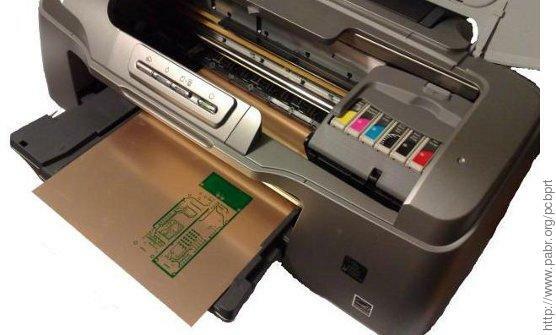 Historically, inkjet printers have been considered useless for homebrew PCB manufacturing: First, the dye-based inks used in mainstream inkjet printers did not provide enough contrast for traditional UV photolithography processes. Second, direct inkjet printing with conductive ink - the holy grail of PCB manufacturing - was (and probably still is) out of reach of hobbyists, because it requires special printing heads and inks. Laser printing was preferred, either in traditional photoresist processes or in the so-called Toner Transfer method. Things changed when it was discovered that some inks marketed for water-resistant "archival-quality" prints can form a coating strong enough to protect bare copper from chemical etchant. This is exactly what is required for the Direct Inkjet Resist Printing process. 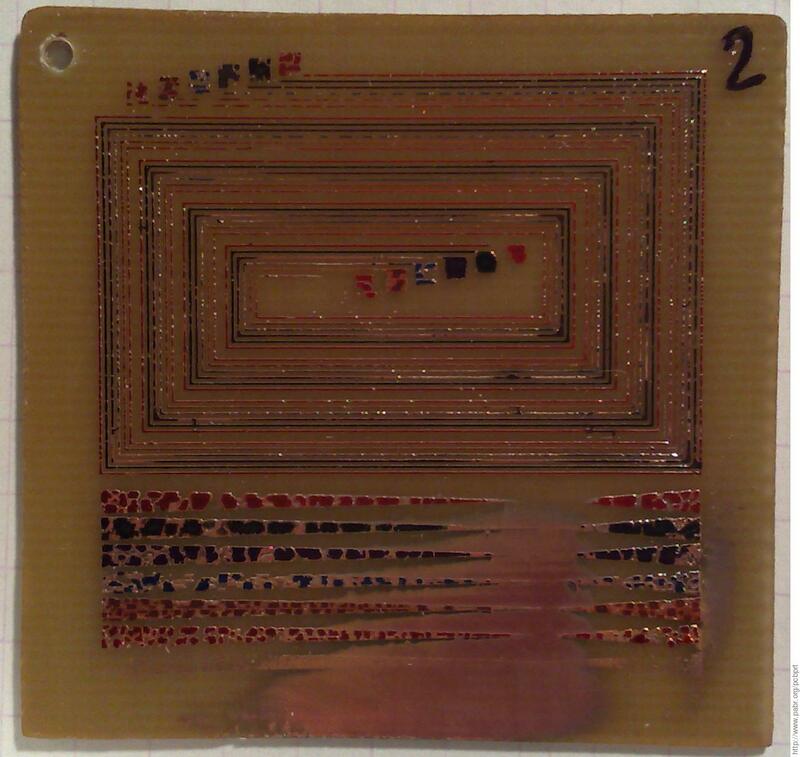 A solder mask and silkscreen could even be inkjet-printed as well afterward, if the printer achieves good registration between multiple passes. Dye-based inks are useless for PCB manufacturing, except maybe in a hybrid process in which wet ink is sprinkled with laser toner powder [HYBRID]. 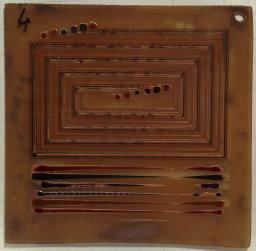 At least one brand of pigment ink can be used as an etch resist on bare copper [DIRECT_RESIST]. A dye-based ink is a solution of ionized molecules with colouring properties. The solvent is almost always water. As a consequence, these inks will dissolve easily in any etchant which contains water. This explains why they are generally ignored by PCB hobbyists. Note that some dye-based inks are marketed as water-resistant, but only when used with special paper. Dye-based inks are designed to soak into paper fibers. Therefore they are unlikely to stick well to bare metal. Pigment-based inks contains micrometer-sized particles of solid colored material, suspended in a liquid. Additives prevents the particles from clumping together. Pigments must be "glued" to the surface of media. Historically this was achieved by a resin which cured rapidly as a volatile organic solvent evaporated. 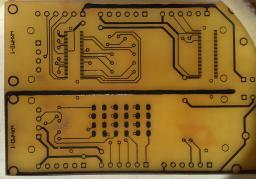 The resulting solid mixture of pigments and resin would be an excellent liquid-proof PCB etch resist. Due to health and environmental concerns, in today's mainstream pigment-based inks, the resin and organic solvent are being replaced with water-soluble binding agents. These new inks may have longer life than dye-based inks, but they are probably not as water-resistant as the old solvent inks, unless special media is used. Regardless of the type of solvent, pigment inks still hold an advantage over dye-based inks, in that we can hope to melt and fuse the solid pigment particles together to form an etch resist. There are essentially two types of inkjet printing heads: thermal (also known as bubblejet) and piezoelectric. Thermal heads, which are found in all low-cost inkjet printers, eject ink by producing steam inside the nozzle. Water is the safest liquid with a suitable boiling point, therefore thermal heads are generally used with aqueous inks. The high operating temperature restricts the range of inks that can be used in a thermal head. This is probably why thermal heads are rarely found with pigment-based inks. Is is commonly believed that using third-party pigment ink in a thermal head designed for dye-based ink will cause clogging eventually. Most mainstream printers with piezoelectric heads are from Epson. 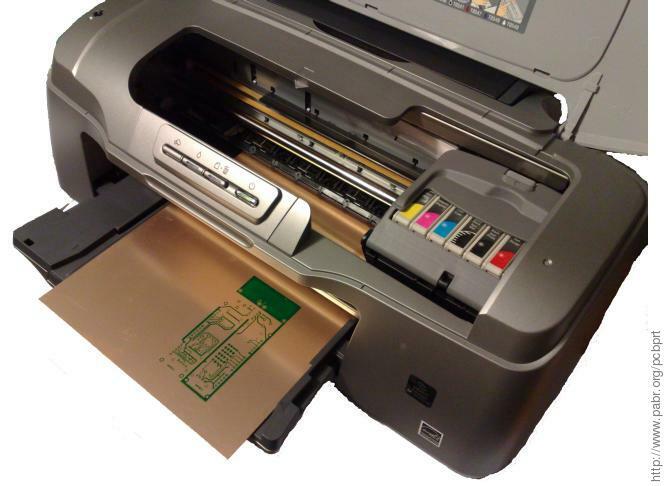 All inkjet printers sold today have sufficient resolution for PCB artwork. Most models are said to have a physical vertical resolution of either 600 dpi (1.7 mil or 42 µm) or 720 dpi (1.4 mil or 35 µm). Many manufacturers advertise "software-enhanced" resolutions up to 5760 dpi (0.17 mil or 4.4 µm). Manufacturers often advertise the size of the smallest ink droplet that their printers can produce (a few picoliters). For reference, 1 pl is the volume of a 12.4 µm diameter sphere. Some printers can print on CDs and DVDs, which are between 1.1 and 1.5 mm thick, and 120 mm wide. This implies, first, that they can raise the head for materials much thicker than paper, and second, that they have a straight path through the printing assembly for rigid media. 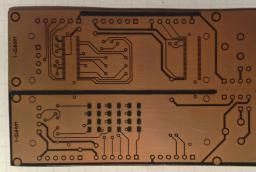 Both features are obviously valuable for processing PCB substrates with a thickness between 0.4 and 1.6 mm. Epson Stylus CX4200 4x Durabrite Ultra (pigment) Piezo 3 pl With mods [VS_CX4200] Discontinued USB. Scanner, Copier. Canon Pixma IP4600 1x pigment, 4x dye-based Thermal 1 pl Yes 100 EUR USB2. Duplex. I chose to experiment with the Epson Stylus Photo R800. Piezoelectric printing head: Should be safe for experimenting with any type of ink. OEM pigment inks: No need to experiment with third-party inks. Continuous Inking kits and chip resetters are available: This may be useful for testing conductive inks later. CD/DVD tray: This is a 210x350x2.2 mm piece of rigid ABS which feeds straight through the printer assembly. The CD is held by its central hole inside a cavity about 1 mm deep. There is a rail of teeth reminiscent of a rack-and-pinion mechanism, but the tray seems to be moved only by rubber rollers. The mass of the tray is 85 g (100 g with a 120 mm CD). 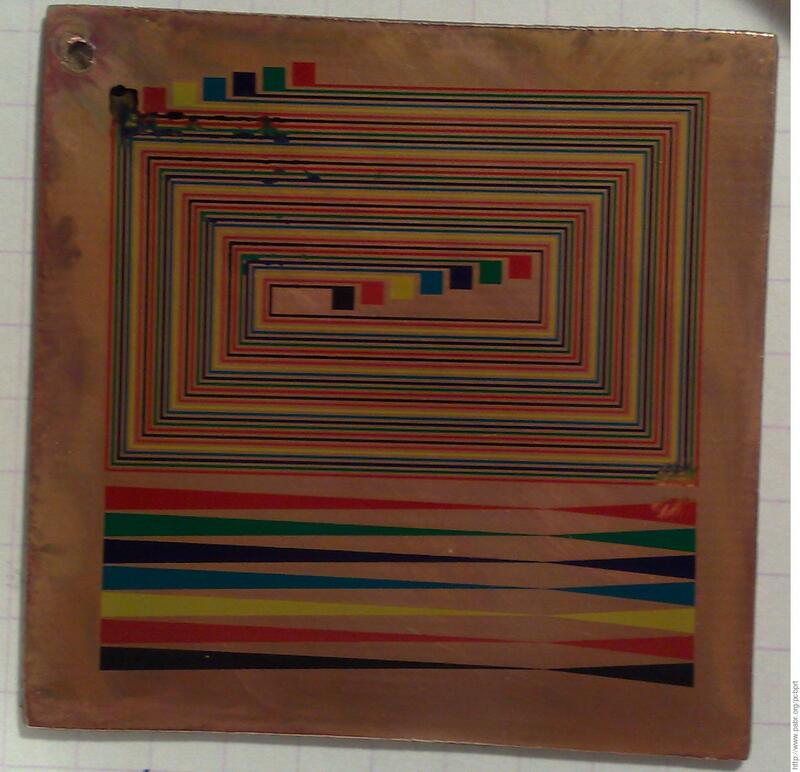 For comparison, a 200x300x0.8 mm board of copper-clad epoxy is 105 g.
Gloss Optimizer cartridge: Apparently this is simply pigment-free ink, i.e. pure resin or binding agents, which might be useful as an etch resist and/or as a transparent solder mask. Non-replaceable print head: These are believed to offer better positional accuracy than thermal heads built into replaceable cartridges. Aqueous inks: The Material Safety Data Sheets [EPSON_MSDS] reveal that Ultrachrome inks contain mostly water, with at most 10 % by weight of dyes and pigments, 5-15 % of organic materials (i.e. resins or binding agents) and 10-20 % of glycerols. In addition, the "Photo Black" cartridge contains up to 3 % of carbon black. Only the "Gloss Optimizer" cartridge contains non-negligible amounts of a powerful organic solvent, diethylene glycol. So this is one of these modern aqueous pigment inks and not a formulation of resin and organic solvent. Non-replaceable print head: Unlike disposable thermal heads, fixed piezo heads can be expected to wear and clog over time. This is not a major concern for low-volume PCB prototyping. No Scanner / Copier functionality - This would have been useful for copying patterns from film or paper, and for automated visual QA testing. The R800 is supported by gutenprint-5.4. Figure 1. 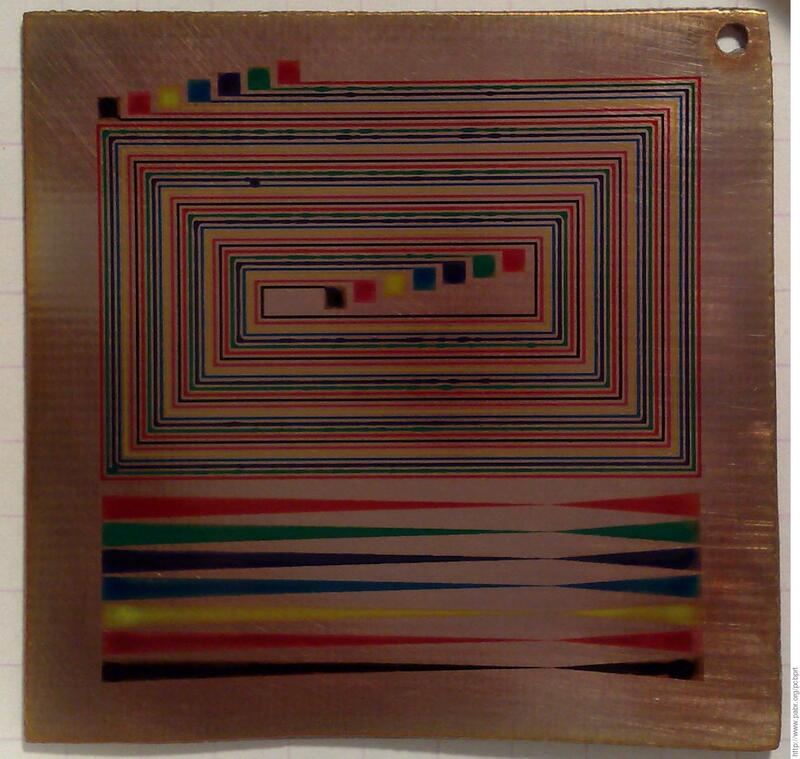 Unmodified Epson R800 printing on 200x300 mm copper-clad epoxy. The Windows driver for the R800 supports three media sources: Paper tray, paper roll and CD/DVD. My plan was to use CD/DVD mode with a piece of copper-clad epoxy in the CD carrier. It turned out that when printing on CD/DVD media, the source image is warped into a 115x115 mm square, and the central hole is masked. I have no idea whether this is caused by the printer or by gutenprint. Anyway the gutenprint driver had an additional media source which looked more promising: "Manual feed (front)". The printer can front-load a sheet of plain A4 paper from the output tray locked in the upper position, but then it refuses to print on it and signals an error with the red "paper" led blinking fast and the green "power" led blinking slow. After many experiments, I found out that the R800 can be tricked into printing on "Manual feed (front)" media by making it print something (anything) on "CD/DVD" media beforehand. I cannot see any rationale for this behaviour. This must be a bug either in the firmware or in gutenprint. 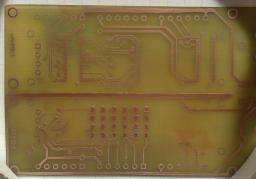 The R800 can front-load raw 200x300x0.8 mm sheets of copper-clad epoxy, but an adapter is required for smaller formats. This is also needed for printing on the last few centimeters at the bottom of the media, because there are no motor rollers downstream of the print head. Instead of modifying the original CD/DVD tray, I decided to build one from scratch. Scan the media left to right across the middle, slowing near the edges. Scan the left edge of the media vertically, possibly to detect holes. Scan several holes in the central area to detect the type of CD/DVD. Scan the media up about 6 cm from the right edge. Scan the top edge from left to right, slowing near the corners. If the width does not match the width at the middle, abort and eject. To pass the detection procedure, a PCB tray only needs to be flat and reasonably opaque in the areas that the printer scans. In addition, it must be free of holes within 2 cm of the left edge. Otherwise the paper detection lever may get stuck (I seriously damaged mine while testing an incorrect design). Finally, the horizontal edges of cavities must be sloped, at least in the upper half of the tray. Otherwise the rubber rollers (which are about 3 mm in diameter) may not be able to climb them. I used sheets of 210x297x1.2 mm PMMA from a hardware store. One side had a pitted "anti-glare" surface, so I was able to print a4tray2.ps (source: a4tray2.fig) on it. I dried the ink with hot air, cut the rectangular apertures, and glued the frame on top of a second sheet. This tray will carry 0.8 mm epoxy in the following formats: 75x100, 50x100, 25x100, 100x50, 75x50, 50x50, 25x50 mm. It is about 0.3 mm thicker than the original CD/DVD tray, but this hasn't caused any problem yet. Print direction . I always use unidirectional printing. Bidirectional printing is faster but makes vertical lines fuzzy, especially when the media is farther from the print head than intended. Resolution . I used the highest resolution, 5760x1440sw. Test pattern . I used etchtest-ink2.ps (source: etchtest-ink.fig) for the etch tests. All seven colors are present. The board is 50 mm wide. The traces are 0.2 mm (8 mil) thick. Acetone (OC(CH3)2) is a powerful organic solvent suitable for cleaning traces of grease, oil, paint and glue. However, it will not remove copper oxides. Figure 2. Poor results with abrasive pad and polishing paste. Abrasive pads can be used to turn copper surfaces "shiny white". Unfortunately the pad scratches the surface, causing ink to bleed along the scratches. Polishing paste can be used to turn copper into a mirror-like surface, but then surface tension will cause ink to collapse into droplets instead of spreading normally. Figure 3. Abrasive pad vs. 30 s pre-etching. Many authors recommend pre-etching copper before printing. Presumably the intent is to clean the surface and make it porous or pitted so that ink sticks better. Figure 4. Excellent print quality on pre-etched copper. 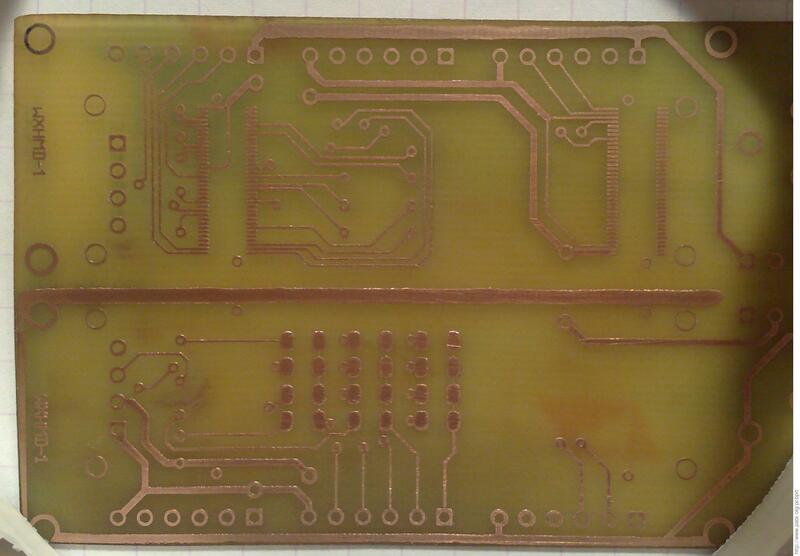 I tried pre-etching in FeCl3. This makes the copper surface brownish, and indeed ink sticks much better than on bare copper. The print quality is as good as on special inkjet transparencies. Unfortunately in my tests pre-etching also causes the ink to dissolve much faster. The longer the pre-etch, the faster the ink dissolves (I tested 5 s, 10 s and 30 s in FeCl3 at 40°C). My understanding is that pre-etching does not clean the surface - quite the opposite. Presumably, pre-etching leaves a layer of CuCl and/or CuCl2 that is either hygroscopic, hydrophile, or porous. The ink soaks into this compound, but does not cover it enough to protect against further etching. When CuCl/CuCl2 goes away as part of the etching process, so does the ink. Clean copper with an abrasive pad until it is "shiny white". Try to rub a droplet of water across the bare copper surface. Note that surface tension pulls the film of water back into a thick droplet. Pre-etch in FeCl3 for 30 s at 40°C, or until the surface becomes brown/purple. Try to rub a droplet of water across the pre-etched surface. Note that the film of water can be spread wider and thinner than on bare copper, and that the surface can become "wet", unlike bare copper. Keep a drop of water on the pre-etched surface for 15 minutes. Note that the wet areas become blue-green. 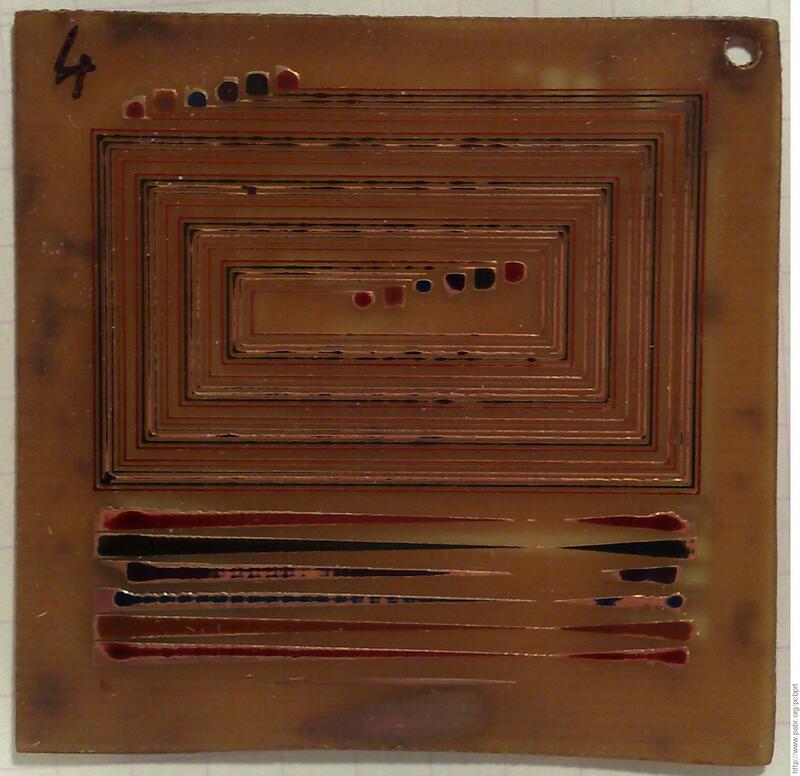 Heating pre-etched copper above 100°C may dehydrate CuCl2(H2O)2 into CuCl2, improving its ability to absorb ink. If the surface remains warm during printing, the ink will dry faster. Moderately heating bare copper will accelerate natural formation of red cuprous oxide (Cu2O). Note that cuprous oxides are not soluble in water (unlike chlorides) and apparently retain ink better than metallic Cu. Despite marketing claims, modern inkjet inks have poor water resistance (at least on plain paper) and will dissolve easily in solutions of FeCl3. They will not even cure unaided: print something on bare copper, and the ink will still be wet after one week at room temperature. Baking the ink solves this problem, presumably by evaporating the water and/or by fusing the pigment particles together. I was able to cure inks with a hot air gun at 230-260°C. However, since copper has excellent thermal conductivity, it is difficult to heat uniformly with a localized heat source. For better temperature control and longer bake times, I used a small household oven. I used 1 liter of 12 year old FeCl3, in a vertical bubbling bath at 40-50°C. Etching 35 µm thick copper takes at least 7 minutes. Use naturally oxided copper-clad epoxy. Rub with a paper cloth and acetone. Dry 5 min with a hot air gun at 160°C. Bake 60 min in a toaster oven at 220°C. Etch 10 min in FeCl3 at 40°C. Clean remaining ink with a paper cloth and acetone. Note the two 70-pin 0.4 mm-pitch connectors and the 0.2 mm (8 mil) traces. Figure 7, “ Line thinned by surface tension ” shows a typical defect of the inkjet process: surface tension sucked the ink from a thin trace into the large pads it connects. 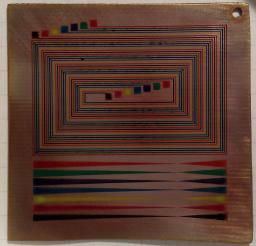 An unmodified mainstream inkjet printer can print on copper-clad epoxy and other rigid media up to 210x297x2.4 mm. Baking does turn pigment-based inks, even aqueous ones, into a suitable etch resist. Trace widths of 0.2 mm (8 mil) are easily achieved. 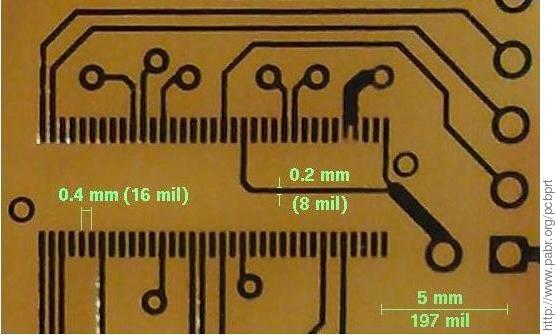 Ideally, the effect of surface tension should be taken into account when designing PCB artwork. There is no need for sophisticated surface preparation. The best results are obtained with naturally oxided copper cleaned with acetone. A temperature-controlled soldering iron with a tip filed into a sharp point. 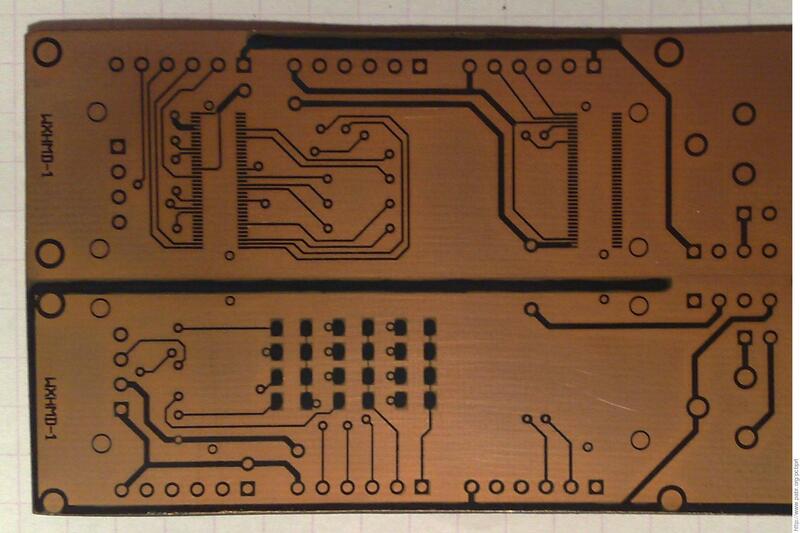 For double-sided circuits, etch and drill two boards, glue them back to back, and drill again. For small vias, drill with a 0.5 mm bit, pull 0.5 mm copper wire through the hole, cut very close to the surface, and solder carefully. Together with the binocular magnifier, 0.3 mm solder wire and a steady hand, a regular iron with a sharp tip can easily solder rows of contacts with 0.4 mm pitch. After the glue has set, gently lift the daughterboard and solder the connectors. Ball Grid Array components (although homebrew reflow ovens have been demonstrated, fine-tuning the process and troubleshooting soldering defects under large BGA chips is bound to be hard). Boards with three layers or more (one can glue any number of substrates together, but vias become impractical). Improve robustness by controlling copper oxidation, instead of relying on whatever the manufacturer happens to deliver. Alternatively, apply a coating that would fixate ink onto deoxidized copper. Try pre-etching with other etchants than FeCl3. Investigate the "Gloss Optimizer" ink. Control registration to print double-sided boards. Experiment with "UV" inks: Ink manufacturers are trying to switch back to resin-based pigment inks, except that the resin would be cured by UV light inside the printer, rather than by evaporation of an organic solvent. Such inks might be good etch resists without even baking them. Experiment with binary inks, i.e. feed a resin and a curing agent into separate cartridges, and mix them on the substrate. Experiment with conductive inks. Most publications in this field involve silver nanoparticles, carbon nanotubes and other exotic materials. The approach of [BIDOKI2007], where a metallic salt and a reducing agent are deposited consecutively to produce metal particles on the substrate, might be more suitable for hobbyists. [DIRECT_RESIST] Direct to PCB InkJet Resist Printing. Stefan Trethan and Volkan Sahin. http://techref.massmind.org/techref/pcb/etch/directinkjetresist.htm. [ST_C84] Direct to PCB InkJet Resist Printing. Epson Stylus C84. Stefan Trethan. http://techref.massmind.org/techref/pcb/etch/c84-st.htm. [BD_R220] Direct to PCB InkJet Resist Printing. Epson Photo R220. Bora Dikmen. http://techref.massmind.org/techref/pcb/etch/r220-BD.htm. [FSE_R280] How to Make an Inkjet Direct PCB. Full Spectrum Engineering. http://www.fullspectrumengineering.com/tutorial.html. [VS_CX4200] Direct to PCB InkJet Resist Printing. Epson CX4200. Volkan Sahin. http://techref.massmind.org/techref/pcb/etch/cx4200-vs.htm. 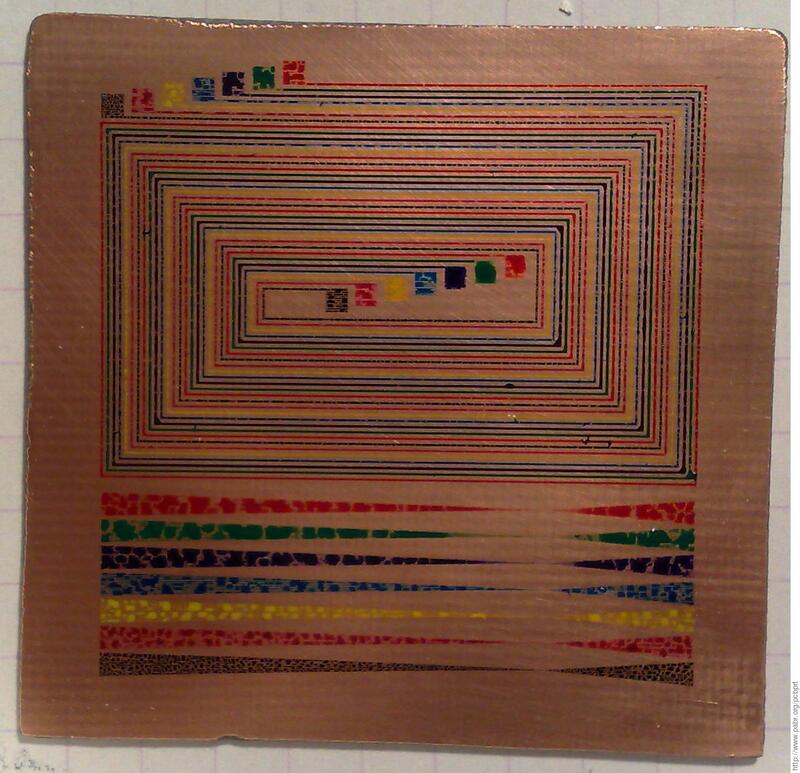 [HYBRID] Printed Circuit Board fabrication via Resist / Etch w/ InkJet & Toner Hybrid. . http://techref.massmind.org/techref/pcb/etch/hybridinktoner.htm. [Inkjet_PCB_Construction] Inkjet_PCB_Construction. Yahoo Groups. http://tech.groups.yahoo.com/group/Inkjet_PCB_Construction/. [EPSON_MSDS] Material Safety Data Sheets/PIS. . http://www.epson.com/cgi-bin/Store/support/Supportmsdsmain.jsp. [BIDOKI2007] Ink-jet fabrication of electronic components. S M Bidoki, D M Lewis, M Clark, A Vakorov, P A Millner, and D McGorman. http://www.iop.org/EJ/abstract/0960-1317/17/5/017/.